← Maybe the Difference is Me. M love love loves to read. R will actually sneak in some of his own reading time by asking her to get a stack of books, bring them out on the couch and “read” with him. This means he reads his book to himself and she reads hers out loud. I promise we do read to her as well! This weekend M decided she wanted to read her books to S. Overall, she’s doing a great job being a big sister, but I know it’s been tough on her. Just yesterday she told me she didn’t want to have to share her mom and dad with S. She’s doing a much better job being gentle with S and often says that we have to be gentle because she’s very small and fragile. The time leading up to bedtime is hard. She wants me to do things for her, but usually I am the one bathing S and I’m always the one feeding S. She asks to be picked up a lot more than she used to and yesterday in the tub she started crying the way a newborn cries, not her normal cry. I’m trying really hard to make special time for her and tell her how special she is. I know she’ll get over this and I also can tell she really loves her baby sister and loves being a big sister. Moments like the one below are really special. 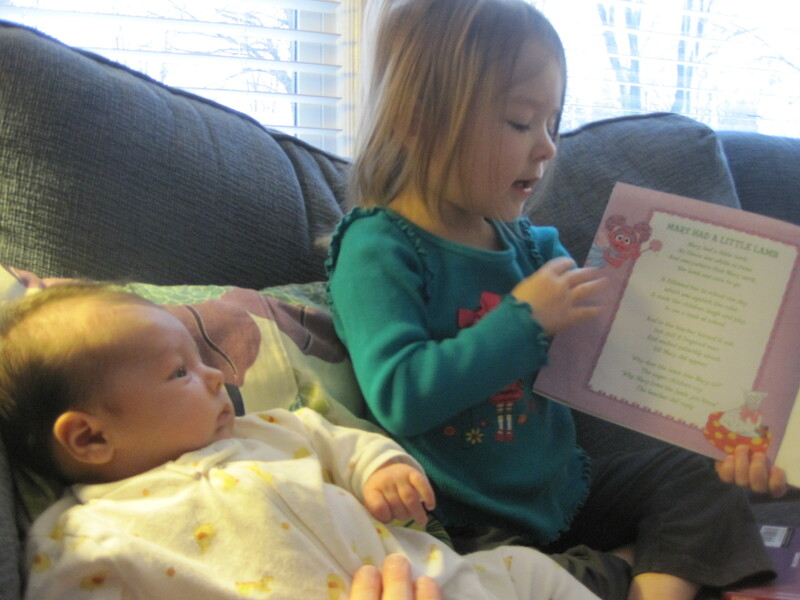 This entry was posted in Miss M., Miss S., Motherhood. Bookmark the permalink. Before you know it, S will be smiling at M and beaming when she walks into the room. It’s amazing to see how babies really gravitate towards kids. I’m sure that M will love it when S gets a bit more interactive. Hopefully there aren’t too many rough patches before then.